Bedford Athletic deservedly clinched the Midlands One East league title with a bonus point 57-24 victory at home to Paviors on Saturday. Having led the league for 17 weeks of the season and with one game still to play, the team finally put enough distance between themselves and the chasing pack that they cannot be caught before the final round of matches next week. Bedford Athletic were first on the scoreboard with a penalty from James Mortimer on 12 minutes but the opening quarter was a period of nearly constant defence. Starved of possession, the home side had to defend phase after phase of Paviors pressure, but this they did manfully – eventually forcing their visitors away from their line. On the 20 minute mark a midfield scrum saw the home team open up the visiting defence down the left, and a searing Tommy Mills break was enough to put Charlie Darlow away for the first try of the day. 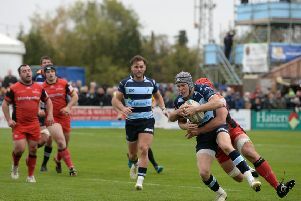 The kick-off did not travel 10 metres and from another scrum on the halfway line it was scrum-half Tom Orton and No 8 Rob Watkins who created the space for Stephen Woodhead to cross the line. From the subsequent kick-off Athletic went through several phases before again attacking from deep, with Mills claiming the third try of the day and Woodhead adding a bonus point fourth. Mortimer converted all four scores for a 31-0 lead as Bedford took full control of proceedings. Paviors pulled a try back just before half-time, with Bob Ratcliffe finishing a move down the right wing. The introduction of Andy Ince off the bench added greater physicality to the home pack at the start of the second half and he set up the fifth try for Charlie Reed. Mortimer converted again. Athletic were briefly undone when fly-half Jonty Green intercepted a pass on his own 22 to race away for Paviors’ second try of the day, but there was to be no let up in the pressure the Champions elect were exerting on the visiting defence. Rob Watkins was on hand to finish off the next opportunity on 59 minutes, with Mortimer’s conversion taking the score to 45-12. Sven Meiland was the next to cross the line as he brought the 50 points up with the seventh try. With a quarter of an hour to go, home thoughts began to drift to the title celebrations and a lapse in defence allowed Ratcliffe to break down the right wing for his second try of the day, Billam’s conversion reducing the deficit to 52-19. But Athletic returned to their task and this time it was Darlow who ran powerfully through the visiting defence, with Watkins on hand to score his second try on 76 minutes. A long kick out of defence turned into a final try of the day for Paviors through Ash Weatherall, but by now the title celebrations were beginning for the triumphant Bedford players and staff. With one league game to go at Wellingborough on Saturday, Athletic have scored 959 league points and 138 league tries.